The word rent has a long history. Here we use it in its more modern definition, e.g. according to Robert Tollison (1982), economic rents are “excess returns” above the “normal levels” that are generated in competitive markets. More specifically, a rent is “a return in excess of the resource owner’s opportunity cost”. Joseph Stiglitz (2012) adds: often by the virtue of position, not by what one does. Examples are income through hidden or open subsidies by the government, laws that restrict the market place, lax enforcement of existing competition laws, privileged access to natural resources, monopolies or cartels, government restricted contracts, use of advance knowledge, advantageous zoning laws, infrastructure works provided by the government, straight forward corruption . . .
See also Jean Tirole, 2014 Nobel Prize winner for economics, on market power, anti-competitive behavior, collusion tacit or over . . . All those things often happen on the down side of the supply/demand curve resulting in higher prices, creating less demand with the supply controlled by a few creating more profit for them. Negative sum games. There are two models to organize the economic playing field; one is promoting rent seeking and the other is promoting a level playing field with access for all. Rent seeking countries are most often rich in resources (Middle East, Africa, Latin America) with rent as getting state assets (far) below market price. The Mexican Carlos Slim, the richest man in the world, is the archetype. He made his wealth by “getting favors” from Mexican politicians. More level playing fields are found in countries with mature democracies (US, EU). Bill Gates, the second richest man, started by making and selling something. Later on, he, too, found the benefits of rent seeking. Politics is the only change agent. Some remarkable examples in reducing rent seeking are found under Lula in Brazil . . . and . . . perhaps . . . in a few years, the Philippines under Benigno Aquino? Increased rent seeking is found in the US (see the increasing number and influence of lobbyists), with the financial crisis of 2008 a reminder that more regulation is needed to keep the playing field level. The Philippines has a long history of rent seeking. The Spanish excelled in exploiting their position. They contributed little in the production of goods. American theory and practice was quite different in their colony. Clever Filipinos easily exploited the “naivety” of the American civil servants. 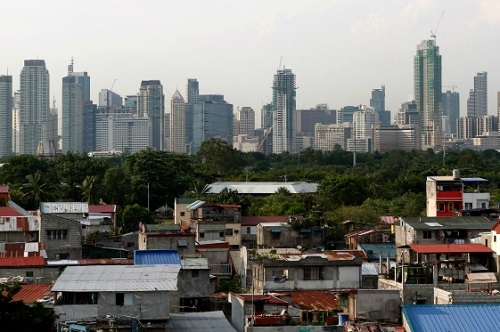 Independence removed the last obstacles for the expert Filipino rent-seekers to boom. Natural resources were plundered, land ownership was vague and easy to reallocate, plenty of protectionist measures were installed to eliminate competition . . . This opened the door for very strong dynasties to dominate the political arena, except for some brutal individuals who fought their way up via illegal activities such as smuggling, gambling, extortion . . .
Dynasties, or control in the hands of a few, make it much easier to guarantee that all mechanisms to create rent stay intact. Cartel formation and distributing natural resources create entry barrier . . . Alliances easily shif according to needs. All individuals or coalitions switch to support the winning political party. At the top everybody is related to everybody. The making of mutually beneficial “deals” is a respected art form. But this inexperienced President, Benigno Aquino III, who got his economics formation in the US, surrounded himself with other more or less “young technocrats”, Mar Roxas, Cesar Purisima, Jose Rene Almendras . . . Ending rent seeking seems to be their focus: fighting corruption, stimulating competition – e.g. adherence to new procurement laws – and improving transparency (but where is the FOI bill?). This is certainly one reason for the current economic growth. The president’s “No more wang wang (= no more privileges)” initiative and his belief that “Right is right and wrong is wrong; there’s no such thing as morally wrong and legally right” are major roadblocks on rent avenues for the trapos and their friends. Typically rent seekers fight back with TRO’s and the help of many in the judiciary, with support of a Catholic church that is afraid that progress will harm their Catholic values, or with the help of the poor who are afraid to lose their election handouts and yearly cakes, preferring the (often fake) “protection” by a big man over real progress. Vice President Binay’s wealth is clearly built on rent. His authoritative positions allowed him to deal in government prerogatives, helping others to thrive on rent in return for “favors” and by straightforward corruption, as we see with the parking building scandal. All came from his position as mayor in the richest municipality of the country. Very little came from direct wealth creation. The piggery and flowers? But didn’t he get Makati resources to work there, contractors to give him below market prices, customers paying above market prices? Every centavo he owns is due to rent. What can you buy from a mayor’s salary of P50,000 a month except some groceries? He remains powerful while he has two strong legs supporting him: first, all other successful rent seekers, and then the poor. Both groups have in common that they see money as the highest good, the highest value, on the same level as family. But for the poor money means food. There can be no higher priority; you need food to survive. For the rich, money means wealth, and for them there is no higher priority. Wealth creates status and power, and it feeds their ego. The middle class is caught in the middle. A lot of their labor disappears into the pockets of rent seekers. The poor remain poor and contribute little to the economic engine due to inefficient production and very little consumption. The ongoing battle in the Philippines is emerging between the two opposing parties, those trying to save the rent seeking economy and those trying to create a more level playing field for all. Trapos and the poor versus younger (US schooled) technocrats and a growing middle class. To battle rent, the only possible change agent is political intervention. The sustaining or enhancement of the Aquino Administration’s changes is crucial. For the poor, money is very high on their value scale and they can easily close an eye to the corrupt ways a big man amasses his wealth. The democratic challenge will be to convince the poor that, while seeking money for them is a virtue, seeking easy money from the rich is a deadly sin. They have to understand that rent not only gives them a smaller part of the cake, it reduces the size of any future cake too. Even if it costs more. On first look, with only a basic understanding of costs vs benefits, roi, insurance, risk etc., rent is simply cost looked at from the point of view of the unknown (time) and politics is but a real-time system of immunity directed towards that unknown. The science (economics) still escapes me. The morality, I understand a little also. 2. The simple definition of rent that you offered several days ago — which was that rent is “making money by other ways than just creating wealth” — makes the concept easy to understand. 2.1. Building a factory to manufacture products that will be sold to the market, to employ people, to increase the personal income of the employees and the owner-employer, thereby contributing to national income and productivity is NOT rent. 2.2. Lobbying the government to build a highway to improve access to the factory IS rent. Lobbying the government to disallow competition IS rent. Lobbying the government to rezone the land surrounding the factory from industrial to high-quality residential IS rent. These activities are not directly productive and they are done at the expense of others. 3. As you illustrate, we are a nation of rent-seekers – then and now. The powerful, the rich, the poor, the Church are caught in a circle of deadly symbiosis. We need to break the circle and reject politicians who, like Binay, maintain and flourish in the status quo. 4.1. Whistle-blowers have exposed the excessive rent-seeking of private citizens and powerful corrupt public officials. 4.2. Investigative media have kept these corrupt rent-seekers – rentiers? – to the fore of public consciousness. 4.3. Public opinion, as expressed in social media, has been unceasingly condemnatory of these corrupt rent-seekers. 5. Perhaps between the public shaming of excessive rent-seekers and the incarceration of the most corrupt officials, we will be able to establish a level-playing field and an inclusive society of social equality, if not of honor. Whistle-blowers, media, public opinion can pressure politicians, but all will repeat itself as it did in the past if they stay put. The trapos form coalitions to maximize individual profits, not so much to serve the nation, or their “bosses” a powerful term introduces by Pnoy. FOI, procurement laws, new ways of budgeting… are tools to reduce rent. In this administration some follow the lessons of the professors economy more than the rent seeking lessons of their fathers. Correction: that should be “the churches” rather than just “the Church”. In certain respects, the rent-seeking, if one may call it that, of INC surpasses that of the Catholic Church. The “invisible hand” as defined by Adam Smith does not always work in a free market. It is easy to tilt the market in ones favor. The extra profit he makes because of it is called rent. In the Philippines this tilting of the market by doing somebody favors in more the rule than the exception. Not all methods to get/produce favors are thought in American business schools, but they can easily proof that leveled market produce the optimum sum. Best for all, but not the best for the individual “thieves” between us. (thieves between quotes why not all is illegal, laws can tilt the playing field too) Hence best for the nation is not always best for an individual. In mathematics an optimum has to be found within certain accepted constraints. When someone confesses to the mathematical function but changes the constraints he might find a different optimum. Manipulating constraints is the strength of rent seekers, not improving the parameters of the function. Me too, I hate how economist can mangle mathematics to morph a simple optimization problem into incomprehensible graphs. It seems they don’t know that calculus was invented yet. So what I wrote is my own superficial understanding as an engineer that will never stand a critical review of an economist. Toll gates is one, illegal shortcuts another and plain stealing. Economists have other more sophisticated words, not to offend their sponsors too much I guess. It appears that Binay is already found guilty of overpriced parking structure. Binay should be hanged and beheaded because the building of parking structure has evidences that it is overpriced. Binay and his phalanx of lawyers cannot deny it. Binay got to be beheaded. There is prima facie evidence. As to the Hacienda, well, Binay has declined. Government cannot know. The Philippine Media made innuendoes that Tiu was the frontman of Binay in the Hacienda. Tiu is not giving back the Hacienda to Binay becaue it is in Tius name. Binay cannot sue Tiu of abbrogation of agreement because Binay has nothing to show to the court that there was an illegal agreement that Tiu was only the frontman of the rock group Binay. So much for that. People elected Binay and his family by the people of Makati. Meaning the high-heeled snooty-englishctzes snob condo-dwelling clique and most of all from Forbes. It is not the people that elected Binay. It is those equally corrupt businessmen doing businesses in Makati living in luxurious dig. So, therefore, Those People In Makati should be sent to prison. Pronto. Once Binay is found guilty. Makes sense. And, oh, before I forget all those equally clueless flying absentee OFWing voters made Binay the Vice-President. Everybody is feeding on everybody. Everybody are the sinners. The usual victim of Binay, Gloria, Purisima and Ampatuan is not the people. It is JUSTICE! Because Filipinos are sadomachostic. I agree with Edgar. Indeed, I’ve been here for a good number of years, heard that the Philippines is a “rent-seeking” economy, but never really grasped the meaning. What is particularly striking to me is the latter section, how both the poor and the rich are joined – the Binay constituency – by the rent-seeking ways of playing games. It leads me to believe a Binay presidency would split the Philippines into two classes. The barbell . . . or dumbbell . . . of the rich and poor, and the bar itself, a middle class being stretched and stripped of its goodies and kept impotent. Yes. The middle is loud (in social media) but impotent, I fear. Finally I am able to get some understanding of what “rent seeking economy” means. Thanks very much fellas. What a wonderful creation. Binay just lost another 15% from his voter base if we can get that on the two main television stations prior to the election. I’ll donate, for sure. Here’s the organization that put it together. FNF Foundation. Ich liebe Deutchlanders who think like that. Right, I was laughing at the purely coincidental displays of Pacquiao, Estrada, Madam Marcos and some others that probably whizzed right by me. 1. Strong and enforced rule of law. 3. Streamlining government procedures to encourage entrepreneurship and business investments. 4. Utilizing indigenous natural resources, raw products and human resources to produce what the nation need instead of importing them. 5. Infrastructure construction and upgrades. (Un)fortunately the administration/politicians can influence all this, but somebody has to tell this to the public that a vote is more than a beauty contest. 1. Justice delayed is justice denied. True politicians can simplify current laws or add laws to open new pathways for delays. True politicians can increase or decrease the number of judges. True politicians can influence the curriculum of lawyers. Boxers, comedians, OJT’, film actors and selfish rent seekers cannot. 2. Mass awareness. Politicians can influence curricula in education. Politicians can dictate the media to air messages of public interest. True politicians can lead by example. Boxers, comedians, OJT’, film actors and selfish rent seekers cannot. 3. Streamlining government procedures to encourage entrepreneurship and business investments. These do not fall out of the blue sky but result from the hard work of true politicians. Boxers, comedians, OJT’, film actors and selfish rent seekers cannot. 4. Utilizing indigenous natural resources, raw products and human resources to produce what the nation need instead of importing them. Same answer as above. 5. Infrastructure construction and upgrades. Boxers, comedians, OJT’, film actors and selfish rent seekers will be optimizing for kickbacks, true politicians will optimize for their bosses. Someone once said that an honest politician is one who when bought stays bought. That’s why the rent system, the highest bidder gets the lease for a limited time. Rebidding, in our case, happens every third and sixth year. In the US it’s every second and fourth year. In parliamentary countries, there is no fixed term of lease. There are no leases in totalitarian countries, the central government owns everything. I think the term ‘honest politician’ is an oxymoron and one ‘who when bought stays bought’ always has his stipulated price because his mind is so engrossed on only one thing-on the price that he could be bought.